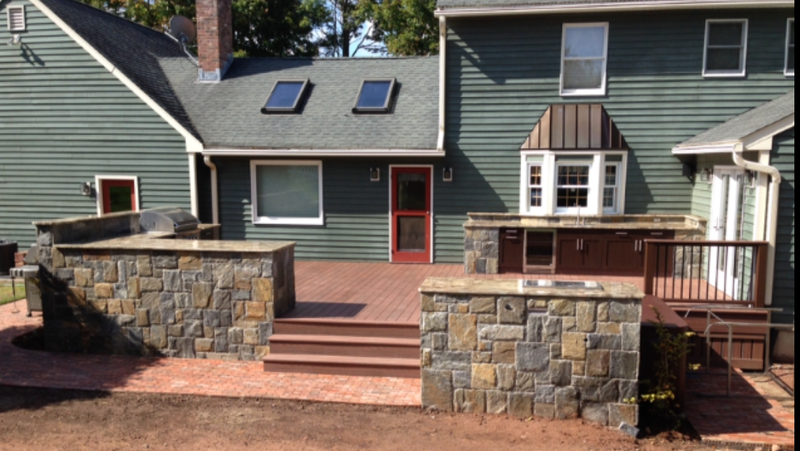 Out with the “stand alone” grill and in with a much grander design enables the homeowners to live beyond the walls of their own home outdoors fabulously. The secret to success for this kind of outdoor living fabulously design is inherit with the designer’s ability to understand the family’s lifestyle behavior indoors and portray some of that trendiness outdoors. By using this type of approach the designer has the ability to personalize the outdoor space to exactness of use and lifestyle for each and every family member. Outdoor living fabulously has exploded with desire as more and more family’s earn for spending quality time outdoors with friends and family. When the design layout feeds into all family members likings touching upon some of their favorite things to do, the quality of time outdoors heightens the level of quality time spent outdoors. 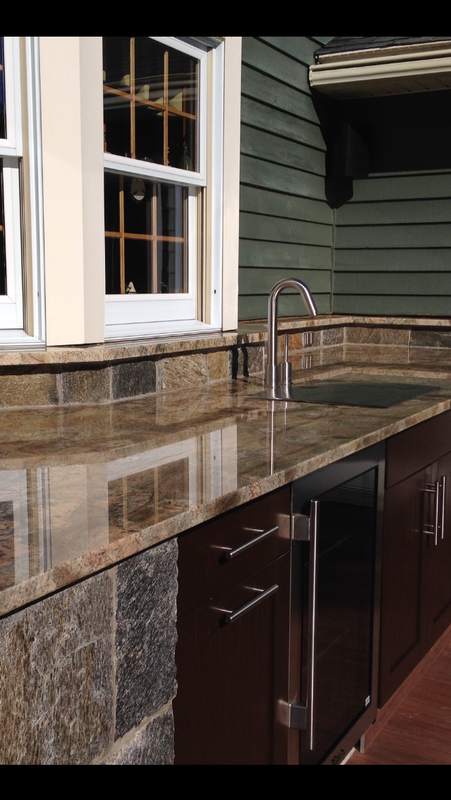 In this outdoor masterful design shown above the homeowners can sprawl from one area across the deck from their outdoor alfresco entertainment bar & beverage Center complete with a true wine beverage refrigeration, Elkay sink , BROWN Jordan cabinetry and a swirling of yellow granite amongst exemplary stone work by Preferred's own masons. 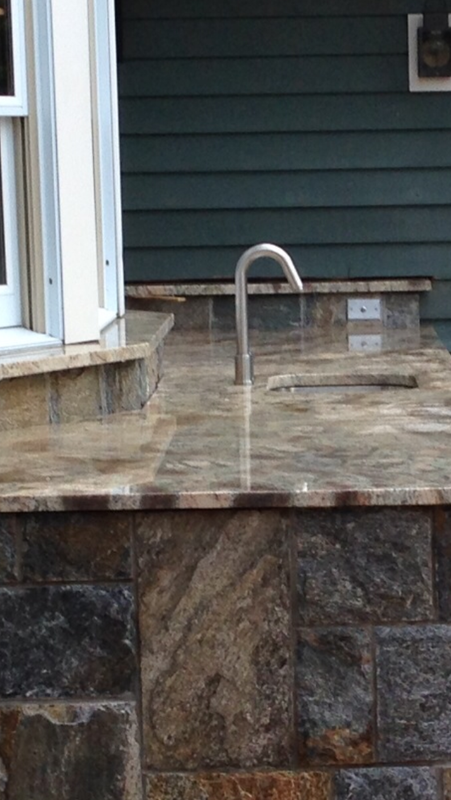 a cool niche feature behind the spa custom built into the deck with a surrounding stone sitting bench, granite top and a remote-controlled outdoor fire burner. 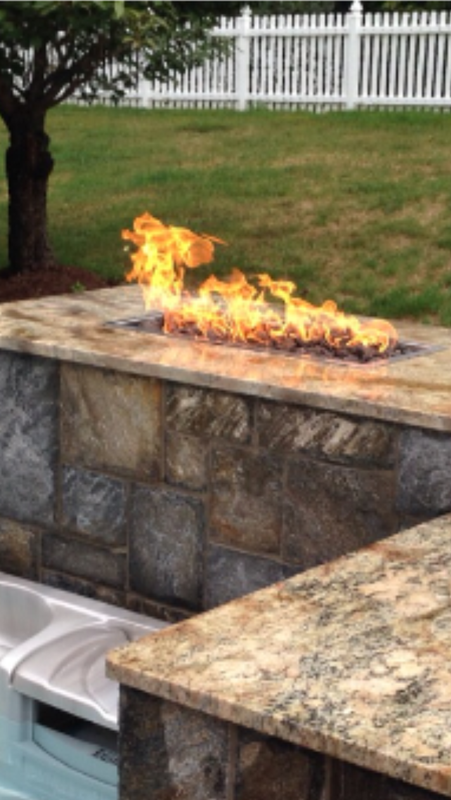 This special fire feature is perfect for heat, light, romance and conversation. A " must have" in CONNECTICUT for those crispy evenings. 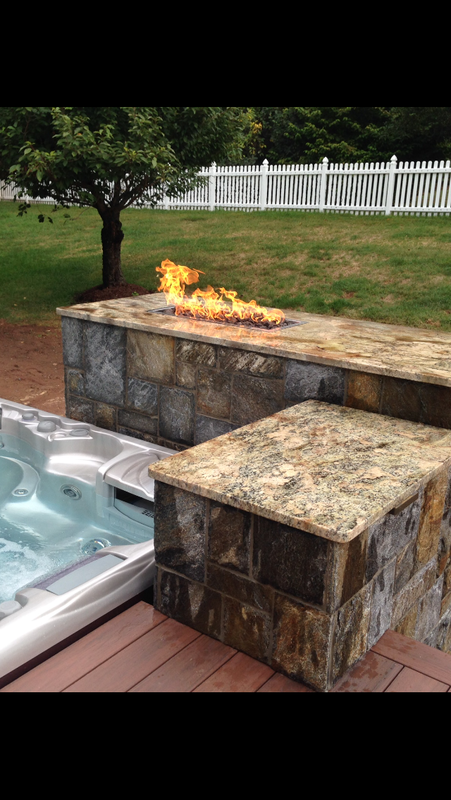 This specialty fire niche gives warmth from the fire well into dimly light evenings in the hot tub spa. All this ambience, romance and conversation from a handheld remote controlled HTpc fire unit. ONE more way in which outdoor living fabulously designer Michael Gotowala from Preferred Properties creates the WOW factor BEYOND the walls of your home outdoors. more bolder colors. This and other fine details make for a much more comfortable living outdoors experience. An outdoor living fabulously experience. 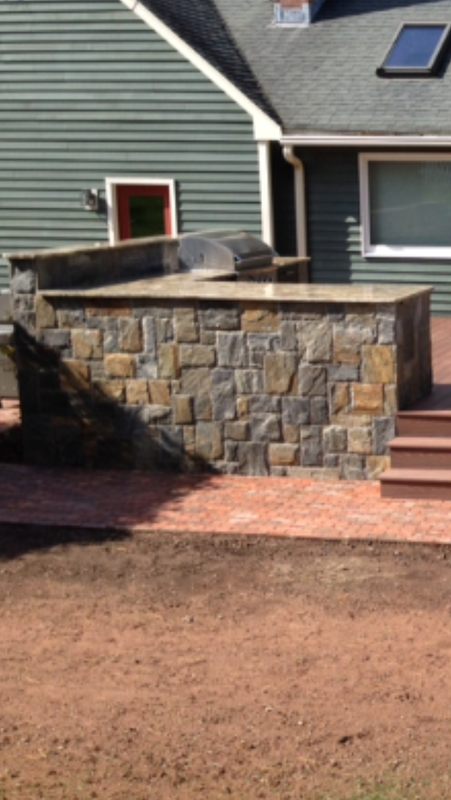 The difference in outdoor living and living outdoors is in the design. 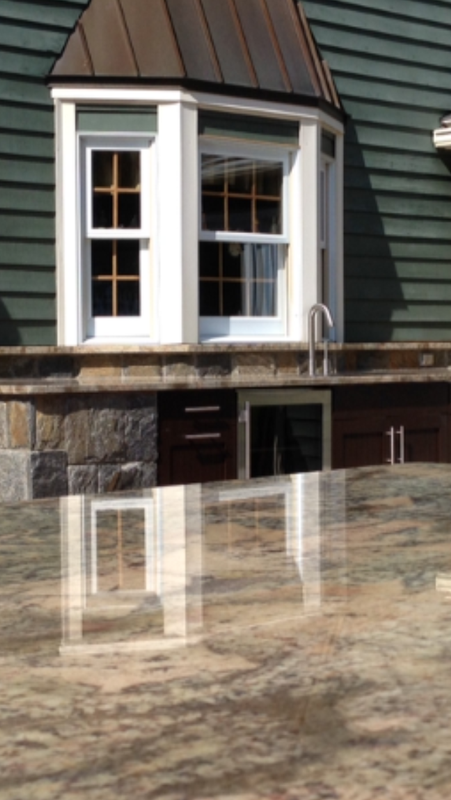 As masterful outdoor kitchen designer Michael Gotowala will exclaim. This is the recipe for success to outdoor living fabulous design ideas. 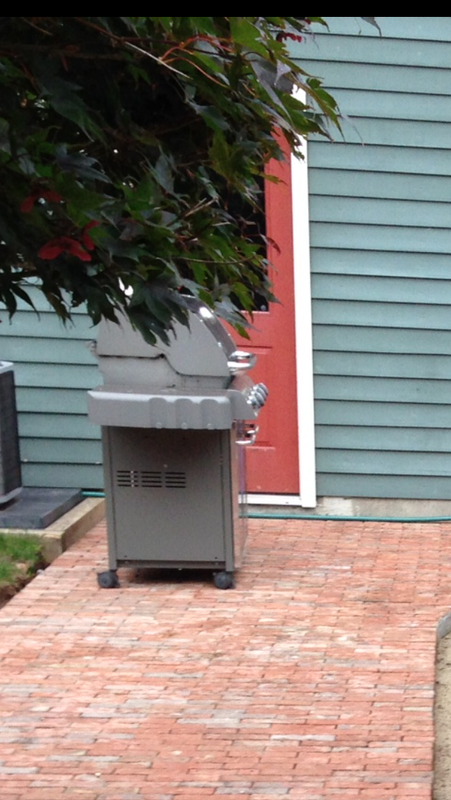 One must have experience with this to produce an artistry of masterful outdoor kitchens. Outdoor living designer MIchael Gotowala Preferred Properties has 12 outdoor kitchen and outdoor living space design portfolios featured nationally in publications such as SIGNATURE kitchen and bath. 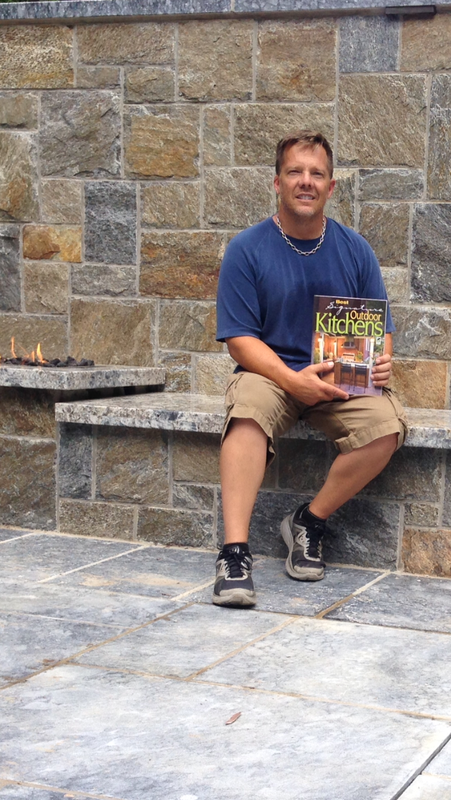 , HEARTH & HOME magazine and hardcover book CREATIVE HOMEOWNERS BEST OUTDOOR KITCHENS where Michael and his staff are the only Connecticut noted outdoor kitchen design builders. Much of all Preferred’s outdoor living design build projects are made possible by Preferred Properties as they themselves house staff talents with the ability to incorporate every aspect of outdoor living from design to decor including exemplary masonry, landscaping, lighting and outdoor kitchen work. Can you see yourself living outdoors fabulously? Wanna see the difference between outdoor living and living outdoors fabulously ? Check this out. 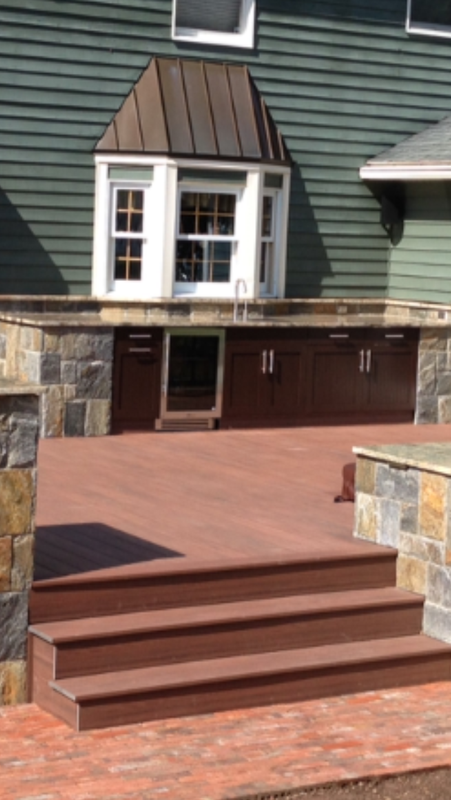 This entry was posted in BEST Signature Outdoor Kitchens, Best Signature Outdoor Kitchens by Creative Homeowner, Connecticut's premier outdoor living designer, EVO grill, exterior lifestyles, Featured Projects, fire pit, gas fire pit, landscape architect, landscape architecture, Landscape Design, landscape design build, landscape design plan, landscape designer, landscape lighting, landscape lighting design, landscaping company, Live a "Preferred" Lifestyle, living fabulously outdoor living design ideas, luxury lifestyles, Masonry, masonry firepit, night lighting, outdoor fire pit, outdoor fireplace images, outdoor kitchen, outdoor kitchen design, Outdoor kitchen design ideas, Outdoor Kitchen Design plans, outdoor kitchen designer, Outdoor Kitchen Designer .com, Outdoor Kitchen Designer Michael Gotowala Preferred Properties, outdoor kitchen images, outdoor kitchen island, outdoor kitchens, outdoor lighting, outdoor lighting designer, outdoor living, Outdoor Living and Landscaping specialist, Outdoor living and living outdoors fabulously, Outdoor living design ideas, Outdoor living designer, Outdoor living fabulously designer, outdoor pizza oven, outdoorkitchendesigner.com, outdoorlightingdesign, outdoorlightingdesigner.com, patios, Preferred Properties Landscaping and MAsonry, Signature Kitchen & Bath Best Outdoor Kitchens, stone work and tagged outdoor kitchen design ideas, outdoor kitchen design store, outdoor kitchen designer, outdoor kitchens, Outdoor kitchens Ct, outdoor living Ct, outdoor living designer, outdoorkitchendesigner.com. Bookmark the permalink.